If Salah can fire in the coming weeks, Liverpool's hopes of domestic and European glory will be boosted. But he really ought to have done better with Keita's equaliser, getting down low quickly enough to block the header but only succeeding in parrying the ball into his own goal. - Liverpool have beaten Southampton in four successive league games for the first time in the club's history. - Southampton have now lost 23 points from leading positions in the Premier League this season, more than any other side in 2018-19. - Liverpool have won seven of their last eight Premier League games when conceding the opening goal (L1), including tasting victory on each of the last five instances. 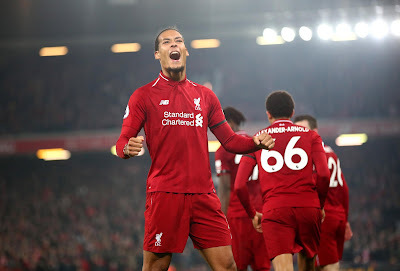 - Following their come-from-behind victory, Liverpool have now won 16 points from losing positions in the Premier League, the most of any side this season. - Liverpool became the seventh club in English top-flight history to concede 5000 such goals after Everton, Manchester City, Aston Villa, Newcastle, Sunderland and Arsenal. - Henderson is the first Premier League substitute to score a goal, assist a goal and receive a yellow card since Graziano Pelle did so against Crystal Palace back in May 2016. - Keitaâ€™s goal for Liverpool was his first Premier League goal of the season from what was his 23rd shot in the competition. Indeed, he is the third player from Guinea to score such a goal after Kamil Zayatte and Titi Camara. - Long is the fourth player from the Republic of Ireland to register 50 Premier League goals, along with Niall Quinn (59), Robbie Keane (126) and Damien Duff (54). Liverpool are back at Anfield on Tuesday for the first leg of their Champions League quarter-final with Porto before hosting Chelsea in the Premier League five days later. Southampton's next game is at home to Wolves in the league on Saturday.